Its a quiet Sunday and I am desperately in need of an unwind and we find a spot that has a casual vibe to it but more importantly the menu looks amazing. This is a new bar / restaurant with a bit of mix, they do brunches, cocktails at the bar and a full dinner in a courtyard style setting. I can see myself wasting a Saturday afternoon here slurping cocktails with a date, or nursing a hangover with some “comfort food” brunch on a Saturday morning or having a civilised dinner with some pretty interesting culinary options. Its a flexible venue. The focus of dinner here is on share plates and a hip vibe to go with it. I let go for once and I actually don’t choose the dishes today (yes do check the sky outside the world might have ended!). My dining companions choose them and I am offered the chance to the review the selection made and nod in tacit agreement. It’ s exciting. 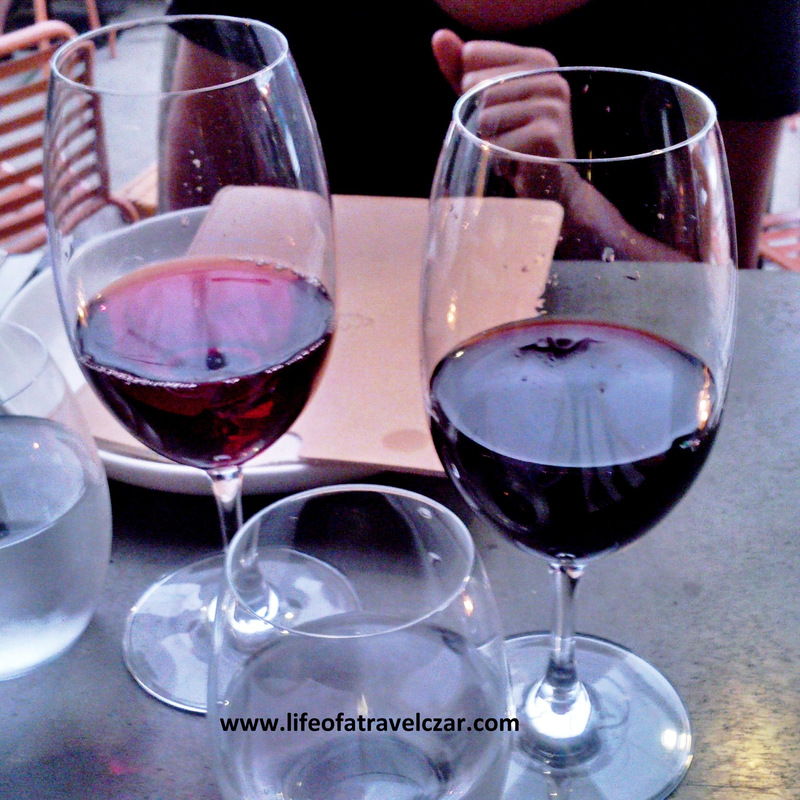 I choose the Twofold Shiraz (2008) from Heathcote in Victoria. I can’t quite remember my dining companions’ selection but it was a light Pinot Noir. For the Twofold, the aromas of blackberry and liquorice dominate and almost influence your view on the wine immediately. Then the ripe black fruit and liquorice flavours flow through to the palate with a subtle bite of oak and some very light hints of spice on the finish. The lingering taste of the liquorice is interesting and almost defines this particular wine. The beautiful tender Coorong Angus flat iron oyster blade steak is cooked to perfection with the contrast of the surface which has borne the brunt of the grill with the beautiful tender rare middle portion which is succulent and flavoursome. The creamy cauliflower puree provides a wonderful and light balance to the dish. The tang and full flavour of the olives stand out while the olive crumbs add yet another interesting texture to the dish. The roast onion, potato and cauliflower add a lovely touch on the side, but query whether they are needed the steak is the star of this dish. The beautiful succulent lamb (which retains its natural flavours and juices balanced with the smoky touch of the skin) is balanced by the cooling yoghurt, the chilled cucumber and that little Mediterranean delight that is the Ratatouille. A perfect dish for a chilled Sunday afternoon. 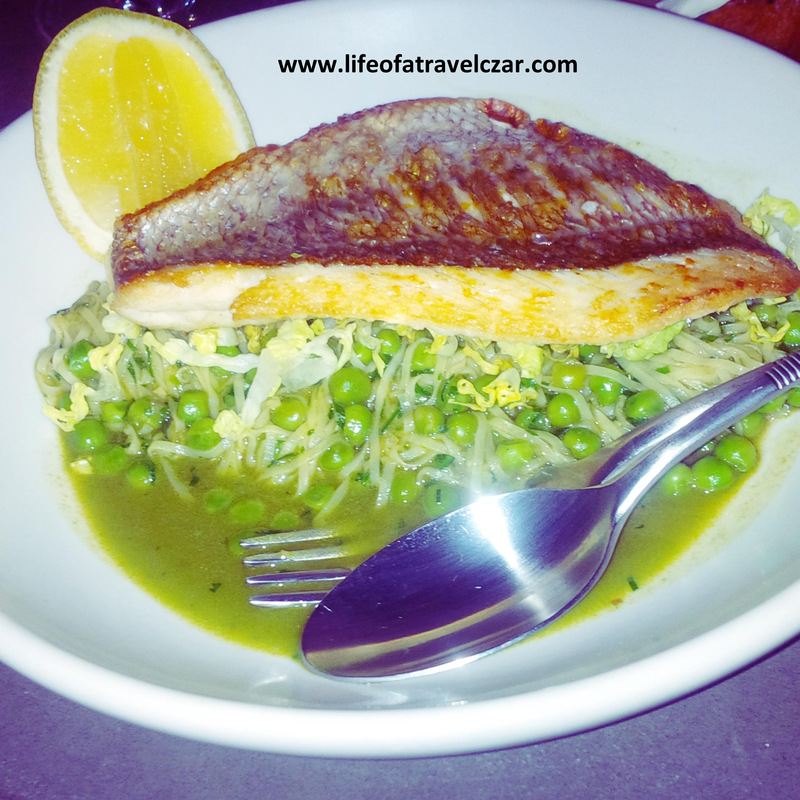 This dish has the whole texture thing going, crispy skin, succulent flesh of the snapper, the sensation of the soft peas and the “slimy” linguini which pairs together to deliver a real kick! The snapper and the salt of the ham hock stew is such a beautiful tasting experience. The fatty richness of the pork belly with the caramelised crispy skin is a delight with the added crunch of fennel and light sweetness of the pear. The mellow miso with the touch of spice in the refreshing sauce mingles effortlessly with the juices of the pork belly. The soft pillowy gnocchi with its crispy caramelised coating provides a wonderful contrast to crunchy artichokes while the creamy reggiano adds a sharp richness to the dish. Its a classic dish that whisks you back to sun and beach of the riviera. Overall this is great place to share food and I think nothing brings you closer to one another than the opportunity to share some beautiful tasting plates with some lovely wine and to see off the weekend in a little style.